It's always a surprise to see how indie folk singers can rock out on stage — just because their album is personal and familiar, their songs confined to your four walls in the dark, doesn't mean it translates to a quiet, intimate show live. 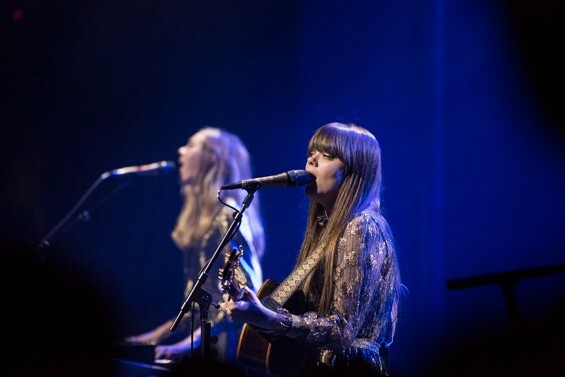 First Aid Kit showed exactly how folk singers transcend quiet spaces at the Observatory in Santa Ana last night. Decked out in gold lame skirts and dresses, Johanna (on the keyboard) and Klara Söderberg (on guitar) came out to the large Monday crowd with guns blazing. It was the perfect first song choice: “The Lion's Roar” made everyone get up and dance as Johanna whipped her golden hair around in a way that would've made '90s Eddie Vedder proud. 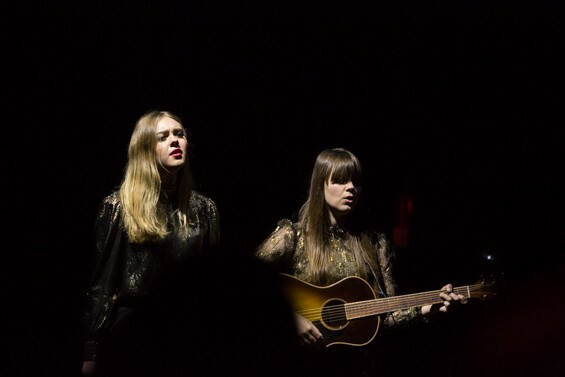 As the duo segued into the title track from their latest album, Stay Gold (their third), I realized that confidence was probably the most striking thing about First Aid Kit. For being in their early 20s, the siblings are remarkably self-assured — maybe it's the kind of comfort that's brought about by singing with someone you've known from the womb, but it was marvelous to see a connection that was evident not just in the way they harmonized and followed each other's cues, but also in their natural banter. Supported by a drummer and a pedal steel/mandolin/guitar player, First Aid Kit wore their country influences on their sleeve. You could swear that Emmylou Harris or Stevie Nicks wrote certain songs such as “Waitress Song” or “My Silver Lining,” not two Swedish women who grew up in a Stockholm suburb. (Apparently, their last two albums were recorded in Omaha with Mike Mogis, a “sort of mecca” for First Aid Kit.) 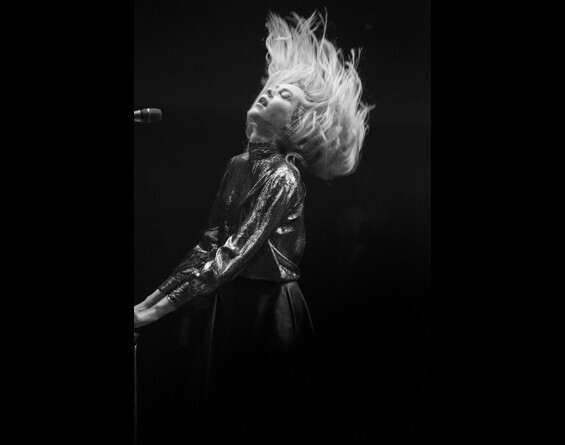 The band's critics say that their lyrics and the tunes sometimes turn derivative, but these weaknesses are glossed over live, overpowered by the sisters' incredible musical bond and harmonies. It was a connection that the audience lapped up, too. Nowhere was this as evident as when they sang “Ghost Town” unplugged with no microphones, just singing to the crowd as if they were busking on the streets. It's not easy to convey a strong longing with power, but they somehow did it. At first, going sans mics seemed like an unnecessary effort toward creating intimacy (“Everyone has to be really really quiet!” Johanna implored) that was ruined by people screeching by the bar and plodding on the wooden floors, but slowly, the audience started singing along. The swelling of voices rose to such a pretty, soft chorus that by the time they got to “But I'll come back to you some day” every hair on the back of my neck was standing up. And there were other highlights — a cover of Jack White's “Love Interruption” preceded by an failed effort at “Seven Nation Army” and a rousing version of “Emmylou” — but watching First Aid Kit is like waking up from a very pleasant dream; you don't really remember what all was in there, but when you think about it, it's all warm fuzzy feelings inside. Critic's bias: I think First Aid Kit's version of Paul Simon's “America” is the best cover of that song ever. Overheard: Some very good audience sing-a-longs. The Crowd: Lots of young women with their boyfriends.